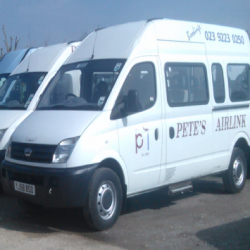 Pete's Airlink Limited is a well established minibus operator the office is located near Horndean, a few miles north of Portsmouth in Hampshire. Our business has grown from its origins as a local taxi company to become one of the largest specialist minibus operators in the area and is a transport supplier to local authorities and other businesses. As well as traditional seated minibuses, we run a fleet of wheelchair accessible vehicles and are the official supplier of services for Portsmouth City Council & Hampshire County Council.